Here is an outstanding resource for those creating / distributing / investigating e-learning solutions. Streaming Media's 2007 White Paper - Online Learning: Textbook Strategies for Video Education. From the blog post: "The pictures are all from an album that belonged to SS-Obersturmführer Karl Höcker, who was Adjutant to SS-Sturmbannführer Richard Baer the Commandant of Auschwitz in 1944/45. The album was passed on to the Holocaust Museum in 2006 by a retired U.S. Army Lieutenant Colonel who was a Counter-Intelligence Officer working in Germany at the end of, and just after the war. As part of the teams hunting down Nazi war criminals he had picked up the album in an abandoned apartment in Frankfurt." "The album shows the ordinary side of barracks life (and ordinary is the right word here) for the troops running Auschwitz." The tease: "... The court determined that Höcker had never been proven to be at the ramp." Sit down and digest the blog posting. This is the power of images. Want more? Check out Hitler's Beneficiaries: Plunder, Racial War, and the Nazi Welfare State by Götz Aly. Forensic Photoshop a best seller? The publisher has logged over 600 unique views of the book's sales page since it was released on the 18th. The orders are coming in. And, to my happy surprise, Blurb was added Forensic Photoshop to their best seller page. I've played American football since I was 6 years old. From the sandlot to college to the semi-pro Blue Knights, I've played every position on the offense and defensive lines. I've played the running game. I've played the passing game. I've played run and shoot and west coast style. I've played for old fashioned coaches and for innovative and risk taking ones as well. I have been successful as a player wherever I was placed. Point me in a direction and I'll make a hole big enough to drive a bus through. I never let my man beat me and get to my quarterback. But, breaking it down further, where was I most successful? 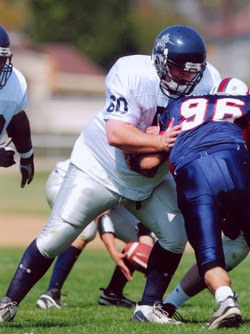 At 6'7", most coaches first instinct was to put me at the end, OT or DE. But, I have flat feet and my first step is not as quick as most. One coach put me at center, but again ... rarely seeing a head's up match, that first step became an issue. At OG and DT was where I was truly in my element. I was guaranteed someone to hit and drive on every play. Same player, same game ... properly positioned I was the most successful. I was able to play to my strengths - power, strength, stamina, leverage, and vision. I could drive my man into several others, opening up massive pathways for the running game or stopping blitzes on the passing game. My weakness, that lack of quickness was mitigated. So what does this have to do with lab gear? Everything. I use Avid for analog tape based projects - projects where analog tape is the source media. Avid has been the standard for years and continues to be a stable editing platform. I've edited countless projects on the various Avids that I've had. Throw in their powerful breakout box, and you can input from just about any source (even HD and SDI now) and work on the uncompressed capture. The weak points of the Avid editor are: steep learning curve for non-editors, omfi files and file system is not intuitive, cost of gear, and cost of service. For digital projects where the source is an odd-sized, odd-frame rate avi file, I use Sony Vegas. Nothing beats Vegas' ease of use. It thinks like an artist. I point the project creator at a file, and the projects settings are matched to the file's properties at the click of a button. It's support for Acid, SoundForge, and Cinescore are just icing on the cake. I can export to a variety of formats and even work with HD from start to finish. It doesn't cost much and it plays well with other programs. There really isn't a downside to Vegas that I've found. For projects were the source is digital tape (digital 8, mini-dv, etc) I use Adobe Premier CS3. I like the capture tool in Premier (my preference) and it supports the many cameras and capture mechanisms that I have here. I also like that I can go straight to DVD from Premier if I want to. It's a little on the expensive side when purchased as part of the suite, but the suite offers some really cool programs - like OnLocation. OnLocation is quite the bonus. With it (used to be DV Rack), we can set up direct hard drive recording of long term surveillance ops, and OnLocation will manage the creation of the avi files on the fly (13gb/hour). I don't have to worry about flipping tapes and capturing later. Everything is handled for me. The suite is great value for the money. With my newly purchased MacBook Pro, I plan on integrating Final Cut into my work flow. Many editors are using Final Cut and I look forward to putting it to the test and see what it's capable of. For screen capture, I have Camtasia, Adobe's Captivate, Ocean's dvrDecorder, and will be working soon with Salient Stills' VideoFocus Pro v3. I'll wait until I've tested VF before I render a final opinion on these tools. Notice that I haven't said anything about "correcting" video in any of these platforms yet. All of the above mentioned tools have correction functions built in or layered on. My choice depends on the source of the video, the case's parameters, and the final output requirements, not the effect I am trying to achieve. All of the various video editors have colour and light effects - so I'm not too worried. 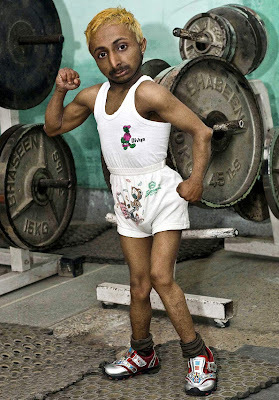 When it comes down to it, just about everything ends up in Photoshop. That is the one program that I wholeheartedly recommend. *Disclaimer: the opinions are my own and do not necessarily reflect those of any employer or client - either past or present. "It all started in the early 1900's in the film industry, when professional movie film widths and frame sizes were formalized with the 35-mm width accepted as standard in Europe and in the United States. This shape was standardized by the Academy of Motion Picture Arts and Sciences in 1927, and became known as the ''Academy'' format. Each frame measured 0.825 inches wide by 0.600 inches high (20.96mm wide by 15.24mm high), and spanned 4 sprocket holes on the film. Images were thus framed in the approximate 4 to 3 ratio of width to height - four units wide and three units high." For those unfamiliar with InfoComm, they offer an outstanding array of training to the commercial AV industry and are worth a look. SignalScape - makers of Star Witness (an FVA platform). Forensic Photoshop to pull the plug on Windows? Frequent readers of this space will remember the stellar service that I received from HP when my laptop died. Amazingly enough, that case is still open - not having been completely resolved. In spite of frequent calls and e-mails, I just couldn't get them to agree to abide by the terms spelled out in the service contract that they sold me. So ... early this morning ... I logged on to the Apple Store and bough a MacBook Pro. This is just the first step in the purge - after over a decade with DEC/Compaq/HP. Soon, my whole business will be run on Macs again (I initially switched when they stopped selling/supporting the PowerMac 9600 - oh how I loved that machine). As I transition, I'll be using Parallels to bring all of my old laptop's stuff into my new Mac. If anyone has experience in using Parallels Transporter, I'd be interested to hear about your opinions on settings, pitfalls, successes, and etc. Thanks again for your support and have a great weekend. Buy your copy of Forensic Photoshop today. With Photoshop, we are (in essence) playing with colour and light. We are bound to end up testifying at some point about what we've done with light - or stuck for a simple explanation in a sales meeting. We've talked about colour temperature before. How do we tell stories about light? What is light? Light as a function of the EM spectrum: only a small section of the electromagnetic spectrum is visible to the human eye. We call this the visible color spectrum. We think of light in terms of three aspects: wavelength, frequency and amplitude. The wavelength distinguishes among different types of light. The frequency of a light wave determines its color. Amplitude refers to the brightness of a light wave. Gamma rays have a frequency of 1018 Hz, (sorry for the problems with superscript) while radio waves have a frequency of 104 Hz. Green is at the center of this spectrum. Blue light waves have a higher frequency and are hardest to see - its the amplification of the blue channel in digital CCDs that leads to excessive noise. Red light waves have a lower frequency. Thinking of visible light with a frequency of about 1014 Hz: this means that our eyes receive just more than four hundred trillion light waves every second. Frequency and wavelength are inversely related. As wavelength increases, the frequency decreases. Think of it this way, if there are a lot of little waves hitting the beach quickly, they could be said to have a short wavelength and a high frequency. If there are only a few big waves hitting the beach slowly, they would have a long wavelength and lower frequency. The amplitude of a light wave is what our eyes perceive as brightness. The greater the amplitude of a light wave, the further the wave is displaced from the mid-line, and the brighter the light. Start collecting stories about the processes in which you employ. Perhaps even create a database of these stories. Light, colour, noise, reflection, and etc can all be explained simply. Your database or list of simple explanations helps when preparing your testimony. You've read in this blog and elsewhere that there tends to be more noise in the blue channel than the others. Seeing blue as a function of frequency helps you and your audience relate to the why - it has a higher frequency and is thus harder to see. Because it's harder to see, it needs to be amplified. This amplification can sometimes introduce noise into the blue channel. Different manufacturers will have varying success at this mechanical process, which is why some cameras have more noise than others. I just wanted to get the word out that I'll be speaking at the ASIS Security Trends and Solutions Conference in Las Vegas this May. My session, entitled General Requirements for Digital CCTV Systems From a Crime Solving Perspective, is scheduled for May 20th, 2008 at 3pm at the Westin Casurina Las Vegas Hotel. Frequent readers of this blog will see right away that the what/how/why model carries through into my presentation. From the abstract: by ensuring that your DCCTV system meets a few simple requirements (what and how), the evidentiary value of the pictures can be increased and the time taken by the police to process the images can be reduced (why). Before installing a CCTV system you should have a clear idea of what you want the system to do and how it should perform. The presentation offers guidance to potential end-users and installers of digital CCTV systems where the pictures are intended to be used by the police or are likely to be used in an internal investigation (why). Here is an interesting link. It describes the process for embedding Flash or Captivate movies in PDF documents. Adding this technique to your bag of tricks may help you out some day. Photoshopsupport.com now has a dedicated space for Forensic Photoshop tutorials. The Forensic point of view has been added to the many tutorials for photographers, retouchers, and digital artists. Many thanks to our friends at Photoshopsupport.com for their continued support of our efforts. ... and don't forget ... Forensic Photoshop has been released. Click here to order your copy today. Forensic Photoshop Book - Now Available! Great news! Forensic Photoshop - a comprehensive imaging workflow for forensic professionals is now available. Every day, hundreds of thousands of images are captured for use in courtrooms and laboratories around the world. The employees of the agencies that must process these images are often placed in these high pressure positions with inadequate training and a lack of resources. What should I do? In what order should I do it? How do I even begin to process these images? These are the most common questions that people ask. Because lives often depend on each image that we process, it is essential that every person employed in the process have a guide that will help them make use of this complex program. A guide that will give them the results they desire in every aspect of image processing – as well as a thorough grounding in the legal / ethical considerations of the process for which they are involved. Forensic Photoshop is for users of all levels. No matter the starting point, or level of proficiency, readers will join in the journey to mastery. Mastery is knowing what needs to be done, how to best accomplish the task, and why the chosen method is the most appropriate. Forensic Photoshop is not simply a book of tips and tricks. It offers a comprehensive workflow – a reliably repeatable pattern of activity enabled by a systematic organization of resources that can be documented and learned. It offers the reader the logical progression of steps necessary to the accomplishing of the goal – clarified and balanced images; images that remain true to their original content and context. Because it seeks to achieve the goal of clarified and balanced images that remain true to their original content and context, the Forensic Photoshop Workflow is a must for law enforcement (image/video analysts, crime analysis, latent print specialists, questioned document examiners, and forensic/crime scene photographers) as well as for medical/scientific imaging specialists and photo journalists. A self confessed Photoshop fanatic since version 3 for Mac, Jim Hoerricks is an artist / designer / photographer and is the Senior Forensic Video Analyst for the Los Angeles Police Department's Scientific Investigation Division. Jim specializes in blending techniques from the design world with the Forensic Workflow. Always an innovator, Jim established the LAPD's Forensic Video Lab in 2001, has been the lead analyst on many of the LAPD's high-profile cases, and helped set the standard by which video evidence is handled by the department. Jim has worked on loan to many local, state, and federal law enforcement agencies and has testified as an expert in Forensic Video Analysis. In addition to his work in law enforcement, Jim is the author of the Forensic Photoshop blog (http://forensicphotoshop.blogspot.com/) and a co-author of Best Practices for the Retrieval of Video Evidence from Digital CCTV Systems. As an CaPOST Certified Instructor, Jim has taught classes on Photoshop, Premier, and CCTV Evidence Retrieval for the National Association of Technical Investigators (NaTIA); Imaging Techniques for the Law Enforcement and Emergency Services Video Association (LEVA); Using Microsoft's PowerPoint to Present Video Evidence in Court for the Los Angeles City Attorney's Office; and has been a part time Photoshop Instructor for the Art Center College of Design in Pasadena, Ca. Here's a site worth a visit. Doktor Jon's CCTV site. "This site is for anyone with an interest in CCTV; but if you think it's simply about how brilliant the technology really is .... you're in for quite a surprise." I received an outstanding comment from Kit in NSW Australia asking about decisions as regards colour. Let's take a look at this question a little deeper. There are times, as an artist or photographer, that I want to create a certain look and feel with an image - warm, hot, cool, cold, and etc. These types of temperature issues can help set the mood and convey a certain message. Look at the images used in advertising and you'll see what I mean. Look at the colour/temperature/brightness choices of ads for vice related products (tobacco and strong alcoholic beverages for example). The majority of these will use images and colours that convey a "cool" sense, regardless of the colour choice. Johnny Walker's Blue Label is a different blue than LA Dodger Blue. The difference is in the brightness value (HSB). Dial down the brightness of any colour to cool it off. In Forensic science, numbers are king. Regardless of my monitor's state of repair, or my calibration method, if I sample an image I will be able to determine the RGB values for a particular pixel within Photoshop. Assuming error is not introduced by a lossy compression scheme, these numbers should be able to be reproduced from machine to machine - providing the repeatability necessary in our process. 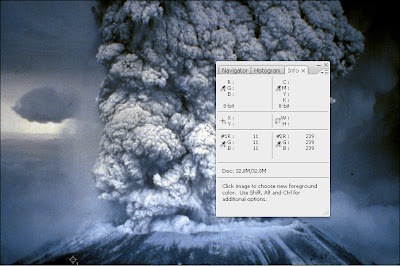 The image above is from the FEMA archives and is displayed on page 14 of Forensic Photoshop. I've provided the link to the image from the source - which is available on the book's web site as well. The image shows Mt. 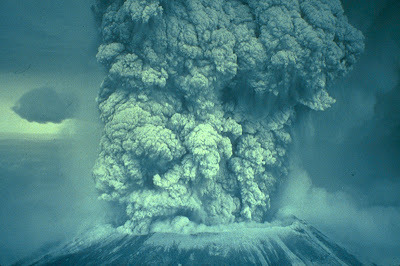 St. Helens errupting. It displays a heavy colour cast. But, with Photoshop, we can get rid of that cast fairly easily. Here's how. 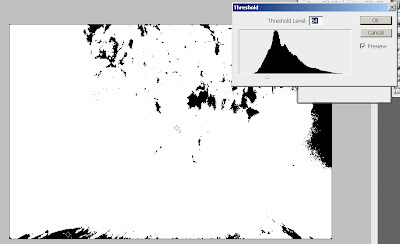 Open a Threshold adjustment layer. Notice the Histogram. Where are the highlights? Where are the shadows? This image is in need of balance. As you slide the adjustment triangle toward the left, the image turns white. As you move it towards the right, the image turns black. Move it to the left until everything turns white, then back left until the first specs of black start to appear (below). Move the cursor into the image and you'll see that it turns into an eyedropper. Shift+Click on a black area to place a marker in the image and mark your black point. Go back to the Threshold adjustment and move the slider to the right. Everything will turn black. Move the slider to the left again until specs of white start to appear. Use the cursor again and Shift+Click on a white area to place a marker and mark your white point. We now have a sense of what's going on with this image. Point #1 is our black point. It reads R=41, G=54, B=69. There's your blue/green cast. I'd like it to read 8-12 for each value, leaving enough room for detail in the shadows. For point #2, R=197, G=234, B=183. White=255. I'd like to see the values between 235-245. Again, leaving enough room for detail - this time in the highlights. Open a Curves adjustment layer. Grab the set black point eyedropper and click on marker #1. Notice the change in the curve. Then select the set white point eyedropper and click on marker #2. This shift will be a bit more dramatic. Depending on the sample size of your eyedropper tool, you may still be a little off. Not to worry. Leave the info palette open an use a Color Balance adjustment to dial in the colour - targetting each colour as well as shadows, midtones, and highlights individually. Thanks again, Kit, for the outstanding comment. Microsoft's recent release of Office 2008 for Mac left out one important element, macros. Their solution: learn AppleScript and re-write your macros. David Pogue, technology writer from the New York Times, has a nice piece about this on his blog. He's also got a book coming out, part of the Missing Manual series, Switching to the Mac - Leopard Series - the Missing Manual, that I'll be reviewing in the future ... as I switch to Mac in the office. Like most of us, I get a ton of free trade magazines every month. This month, two articles from two separate mags really jumped out at me. The first, "Why the French spot terrorists better than Americans" by Peter McKeelaw (Security Info Watch), made me want to throw the issue in the bin. The author starts with a confusion of the terms digital video and IP (no they are not the same, Mr. McKeelaw) and goes on from there. (Note to Mr. McKeelaw, it is possible to connect a legacy camera to an a/d converter and send the packets around a network via IP.) Here is one of my favourite quotes: "Not only are analog video surveillance images less clear than digital video, and therefore less useful, but analog cameras lack the functionality and intelligence of digital cameras. They see less detail, store less detail, and lack the ability to analyze or send alerts when a suspicious event is spotted." Let's treat Mr. McKeelaw like an "opposing expert" and cross examine him and his testimony. "Not only are analog video surveillance images less clear than digital video ... " Assumes facts not in evidence. Clarity is a function of many things; lense, camera body, transmission path, storage medium, and maintenance - to name a few. Mr. McKeelaw, is it true that video images, when stored digitally, can suffer from all of these same issues (bad lens choice, wrong camera body for the chosen view, lack of maintenance, and etc.) as video images stored on an analogue medium such as video tape? Yes, Mr. McKeelaw, it is true and we see it all the time. The problem gets compounded with the compression that is a function of the digital realm. "... therefore less useful ..." Usefullness has many factors. A VHS tape can be placed in just about any VCR and it will play just fine. Some tapes are from multiplexed systems (multiple camera views on a single tape - time compressed) and require a hardware/software solution for proper viewing. But, most law enforcement agencies can handle multiplexed tapes - or know a neighbouring agency that can. Digital video, when saved as a proprietary file type with a proprietary codec, is often worse than useless. Proprietary file types cause severe delays in investigations as agencies are forced to research file extensions and manufacturers. Often times, the manufacturer is a foreign company with little or no documentation about their files. Proprietary codecs offer unique challenges as well. Compression = loss. Security companies determine, for their own reasons, what will be saved and what will be thrown away when designing their own codecs. When an 80x100 pixel face gets turned into 4 groups of beige pixels, I don't particularly find that useful.
" ... but analog cameras lack the functionality and intelligence of digital cameras ... " Camera bodies have many features; back light compensation, day/night, auto iris, and so forth. Many of these features do not depend on transmission method, meaning the video stream can be passed down an analogue or digital signal path. Functionality is software driven. Many of the intelligent/analytic functions often described as "digital" can be accomplished with an analogue signal coming down an analogue path - the signal gets digitized at the control centre. There are cameras on the market which house built in linux based servers and offer much control at the local level. These are rare at the moment and on the upper end of the price scale. More often than not, people confuse the camera with the control room when speaking of functionality.
" ... they see less detail ... " Mr. McKeelaw, how is it that analogue cameras "see less detail?" Is it possible that there are some analogue cameras that "see" more detail than digital cameras? Can you describe the difference between a "digital surveillance camera" and an "analogue surveillance camera" in terms of chips (CCD/CMOS) and capture mechanisms?
" ... lack the ability to analyze or send alerts when a suspicious event is spotted." Mr. McKeelaw, is it true that the analytics and alert functionality is facilitated by the control room's equipment and not the camera body itself - in the majority of cases. I really hate to bang on Mr. McKeelaw so much, but I think I've made my point. Forensics is debate and oration. Mr. McKeelaw's oration, his article in Security Info Watch, attempts to present an "expert's" view of an emerging situation. Unfortunately for Mr. McKeelaw, Forensics is also debate. When subject to cross examination, Mr. McKeelaw's oration - his "expert opinion" - is shown for what it is. It's not an expert's opinion on a critical subject. It's an advertorial written by a marketing executive for a company with a financial stake in driving the market to a particular solution ... conveniently offered by his company. Unfortunately, many of our supervisors read these magazines and get duped into thinking a certain way based on these advertorials. Digital = good. Analogue = bad. Digital = new/future. Analogue = old/past. How about looking at it this way, 1 full frame of uncompressed NTSC video = 1.3MB of data. 1 full frame of NTSC video compressed by the average DVR for sale in the US = .0035MB. Another question, why can't you frame average still frames of "digital video?" It is for these reasons that I've chosen to cross examine a portion of Mr. McKeelaw's statements today. In contrast, take a look at Government Video's web site and an article by Wayne Cole entitled The impact of compact. Here's a quote, "Video resolution is related to the luminance bandwidth in the recorded signal. Smaller imagers capture less light and therefore less resolution. 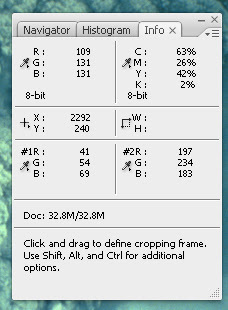 Lossy compression formats like DV, HDV, and XDCAM HD are based on throwing out high-frequency information that will be least noticed by the human eye. In other words, resolution is sacrificed in the hopes that viewers will not notice. HDV and XDCAM HD are worse yet because they use long-GOP MPEG-2 to add temporal compression to produce P and B-frames. Many DV camcorders use 1/3-inch imaging chips followed by 10:1 DCT compression with 4:1:1 sampling (for NTSC). The reason this high compression rate "works" is that the smaller chips don't capture more resolution than the DV format can deliver. " WOW! But wait, there's more, "Like MPEG-2, there is a higher bit rate I-frame only profile for AVC that is not only more amenable to post-production, but can deliver higher resolution given 1/2-inch to 2/3-inch imaging chips. Despite being simpler to encode than AVCHD (there is no need to do the temporal compression to produce P-frames, B-frames, and long-GOPs), the only manufacturer to implement AVC I-frame only, Panasonic, is maintaining the cost of camcorders for this format in a range above the 4K capable Red One system (ed. note: Red One's body is $17,500)." Now, one author is talking about surveillance systems and one is talking about camcorders ... but check out the language used? Check out the implications of what the latter is saying vs the former. "Lossy compression formats ... are based on throwing out high-frequency information that will be least noticed by the human eye." Compression = loss. What did we lose? Is it important? How will a person in a post production role (forensic image analyst) know what was lost and what was retained? How will a jury? If the only manufacturer in the camcorder market to impliment AVC I-frame sells cameras that cost over $17k, how much would a similarly featured surveillance package cost? Is there such a set up? I am sure that there are some outstanding examples of digital video recorders and surveillance systems that employ digital from end to end. I've seen a few of them and have been impressed. I've seen a few, not many. The majority of the stuff I see falls under the DVR category at the local Costco. Notice the difference between "display resolution" and "recorded resolution" on these models. This is the type of stuff local store owners are buying to comply with the regs for selling alcohol or lotto, $4k for 16 cameras. 1TB of HDD and 1CIF images (352x240)? Wow! To conclude, always ask why. Who is Peter McKeelaw and why is he writing his advertorial? Who is Wayne Cole and why is he writing? Why did one choose Security Info Watch and the other Government Video? What is it about the two audiences that is different? Why is that important? As "experts," our clients and our employers look to us for sound and unbiased advice. Sometimes, agencies spend millions of dollars based on this advice. If you get it wrong, your job and your reputation is on the line. Be careful in your choice of source materials ... as this long post illustrates so vividly. So, armed with your forensic skills, read this article and see what questions it brings to mind. When taking pictures outdoors, you should be conscious of the lighting sources (both direct and reflected) as well as the temperature of the light. When processing outdoor shots, don't assume that the images are colour/white balanced. 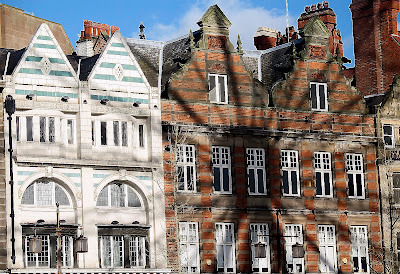 Today's shot comes from Nottingham Daily Photo, a nice little blog about life in Nottingham's city centre. This is one of my favourite photography blogs as it's shot from the hip and straight from the heart. You really get a sense of the Photographer's love for his subject matter, in this case the heart of Nottingham. I love the effect of the shadow from the big wheel on the buildings. To further emphasize this effect, I've restored the focus to the image and made a subtle change to the white/black points using a curves adjustment layer. There are a ton of edges to work with, so I used EasySharp to handle edge sharpening. Noise wasn't an issue here; there was just a touch of noise in the sky which I removed with Noise Ninja. In less than 30 seconds, I managed to kick this image up a notch. Image analysts and retouchers have the easiest part of the process. With a shot like this, timing is everything. The hard part, the photographer's part, is lugging around the camera in hope that a shot like this will come along. Thankfully for us, he was well prepared. Check out more daily photo sites by clicking here. As I wrap up the video tutorials for the book, I just wanted to mention that they will be available on the book's web site as Flash files. Safari, Firefox, Netscape, Opera users - click here. I'm getting ready to move into an new office. What a perfect time to discuss office decorating tips. The office, as it sits now, is painted with a warm gray, with hints of red/burgundy. This was probably matched to the burgundy carpet, which is well worn. The lighting is cheap fluorescent. There are no windows. What a nightmare for trying to calibrate equipment and perform any colour correction. I chose Rosco's TV Black paint for the walls. TV Black is a rich matte black which has a reflectance value of only 3%. There won't be much colour spill or bounce coming from the walls after a few coats of this stuff. I am switching off the ceiling lights and replacing them with a few Torchiere lamps. I found these to be perfect for my new office; full spectrum, 5500K, long lasting, flicker free, and includes a dimmer. I also found this one for my desk. In this way, I can control the source/direction of the light as well as temperature and brightness. If you want to skip the floor lamps, you can also get full spectrum fluorescent bulbs from this company. What about that burgundy carpet? I found these at IKEA, inexpensive and nice black throw rugs. A few of these, well placed, should do the trick. So, for less than a thousand dollars, I can take my regular office and turn it into a colour neutral design suite. You be the judge. Check out the Daily Mail story here. Then, share your thoughts in the Comments Section. As a lead in to next week's release of Forensic Photoshop, I wanted to post some thoughts in response to the feedback I've received from those that reviewed the book. To do this, I need to backtrack a bit and talk about the state of the publishing industry. When I first considered writing the book, I knew that I had a lot to learn about the book business. I began to research the industry, checking out such things as royalties, schedules, rights, distribution networks, tax liability, and so much more. I was introduced via e-mail to Dan Poynter - a publishing expert - who proved to be a tremendous source of information about the process of writing and publishing a book. What I learned shocked and angered me - and also answered a few nagging questions. In 1947, there were less than 400 book publishers in the US. In 2004, there were over 85,000. In 2006, 291,920 new titles appeared on the market, up 3% from the previous year. 4,986 was the average first press run in 2002; second printings average 4,776. A larger publisher must sell 10,000 books to break even. Larger publishers have shifted their philosophy from a humongous first print run to a market reality run. POD Subsidy Publishers Xlibris published 10,269 titles through March 25, 2004. 352 or 3.4% had sold more than 500 copies. 1,463 or 14.3% had sold more than 200 copies. The average per-publication sale number of an Xlibris title is about 130 copies. To publish Forensic Photoshop with this company would have cost me over $6000 - which would have significantly increased the sale price. Of iUnivers's 17,000 titles, only 84 have sold more than 500 copies. Only a half dozen of iUniverse's 17,000 titles made it to Barnes & Noble store shelves. This was mainly due to the unattractive pricing structure. While accurate sales figures are impossible to get, the Author's Guild estimates that a successful nonfiction book sells 7,500 copies. Stop there for a moment. A successful non-fiction book sells about 7,500 copies, but a larger publisher must sell 10,000 books to break even. Print on Demand Subsidy Publishers charge authors up front to produce a set number of books, but only 3.4% of their customers sell more than 500 copies. What does this mean for an idea like Forensic Photoshop - an idea with a small audience (less than 15,000)? Very few larger publishers accept unsolicited manuscripts. Word of mouth top seller of books. According to The Independent, "Publishers can spend a fortune promoting their hottest literary discoveries. Bookshops can deploy all their marketing ingenuity to produce imaginative displays. But when the book-buying public comes to choose a new read, it is word of mouth that counts." Next comes author loyalty. Amazon's rates and accounting methods make it close to impossible to get a small market book into their system at a reasonable price - unless you do one of two things: either use their POD system (Booksurge) which limits full colour books to 100 pages or deeply discount your title in hopes of making a few pennies on a lot of sales (see above for the averages). Amazon makes it quite difficult to get a book into their system without the help of a larger publisher who does not generally accept unsolicited manuscripts. Amazon's biggest selling point is their reach in the market, but word of mouth sells more books than advertising. When choosing a publishing company, you are also choosing an editor, a publicist, a distribution company, and a storage facility. All of these entities need to be paid - raising the price of the book. In small market books, this raises the per unit cost more than large market books. This is the reason, the publishing world tells us, that text books are $100 per unit and Harry Potter is available for $25. Publishing companies also dictate the book's "cycle." There are 4 cycles per year and the author's book is released during one of them with great fan fare. If the author does well and sells out the first run, a second run is authorized. If the first run does not sell out during the first cycle, the books are held on the market for one more cycle, but not promoted actively (the author must hustle at this point to keep his/her books on the shelves). If there are still first run books available at the start of the third cycle, let the discounting begin. The books disappear from the major stores. Orders are limited to stock in the system. Once or if the stock is gone, that's it. Very rarely will there be a second printing at this point. The publisher is just counting themselves lucky to have recovered some money on the deal. If the book does not do well, the author will have trouble getting another book out on the market. Coming from the design business, I was aware that direct to print technology had made its way into the printing industry. This technology allows for printing from computer file (eg. PDF), skipping the traditional 4 colour process and its associated costs of producing 4 plates for each page. I had begun to narrow down my choices on a publisher when a student in one of my classes suggested one of these types of publishers - Blurb. I was having trouble with a larger publisher understanding my desire for a full colour book. "How can I have a book about colour and light without full colour pages?" I asked. Getting frustrated with them, Blurb was a welcome experience. I can offer you the wholesale price - the price that Amazon would then mark up to their retail price. In this way, I cut out the middleman - allowing you to buy direct from the publisher. I can print a full colour book at a reasonable price. I can make style choices not generally available to authors. I can have a book that won't go out of print or become unavailable. I can update the book whenever the technology or case law changes - quickly and easily. I can further reduce the cost of production by having a web site vs. a CD for the work files. I also looked at the publisher's insistance that a book be over a certain page count. I've looked at the books on my shelf and they are all generally within a certain word count, but the page counts vary dramatically. This is done with charts, and images, and layout choices - choices that the consumer pays extra for (more paper, more ink, more $). I made the decision to skip this marketing gimic and offer a book that takes the reader seriously. I respect the fact that you are busy, that you work hard for your money, and that you want the information - not the fluff. Therefore, Forensic Photoshop is not a "Photoshop Bible." It stays on topic and moves from point to point in a logical way. You'll get the information that you need to be effective and prepare you for the other books that are out there without confusion - utilizing a logical progression of steps within a workflow model. No matter your experience level, you'll appreciate the helpful tips on presenting your steps in court - telling your side of the story. I really believe that the direct printing POD model is the wave of the future. There are so many of us who have a story to tell, who have a book just waiting to be written - who are intimidated or frustrated by the process of dealing with a publisher. The POD model puts you in control of the process. You write the book, you design it, you edit it, you decide on the price, you market it, the success or failure is yours. Along the way, you can choose to hire a professional editor, designer, marketer, and etc. You pay only for what you need - saving your customer's money in the process. When I think of some of the topics that I've seen presented at NaTIA, LEVA, and so forth; many of them would make good books. Steve's DVD Authoring for Law Enforcement, Dorothy's Screen Capture with StarWitness, and a Guide to Computer Search and Seizure would be a great first step. Each would have a dedicated audience of 5-10k readers. Each could be reasonably priced. Who knows where this could lead. All this being said, I've enjoyed the process of writing Forensic Photoshop and getting it to market. I hope that it will be a valuable addition to your library. Forensic Photoshop - the release date is here!